October is here which means it's time to start thinking about all things spooky and fun! Since having kids I try to be as creative as possible when it comes to holidays. We love Halloween, so I always plan something fun for the kids. Every year we celebrate with a family party to kick off the night. Dinner is always a Halloween themed meal with festive tableware, and a fun dessert to end the night. It can be a pizza in the shape of a Jack O Lantern, Mummy Hot Dogs, English Muffin Mummy Pizza's or even a big pot of Pumpkin Chili. 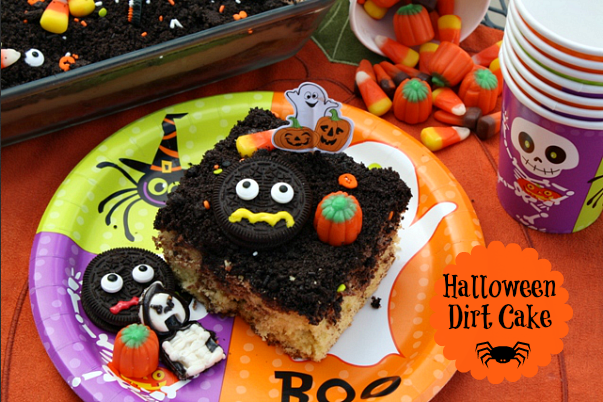 If you're looking for a fun Halloween themed dessert try this kid and adult friendly Halloween Dirt Cake. This dirt cake is a bit different than a classic dirt cake. I like to add a cake bottom, a creamy pudding and cool whip center, and finish it off with a crushed Oreo cookie topping. 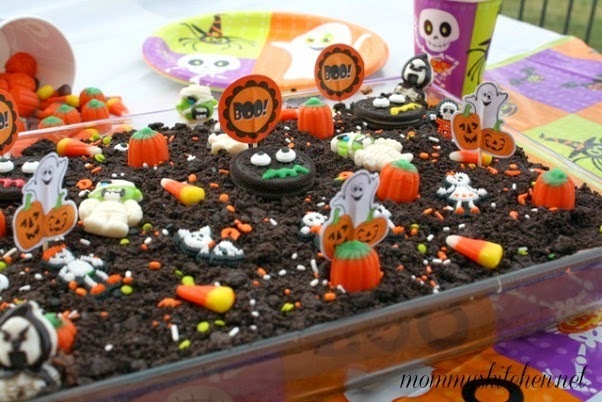 You can decorate your dirt cake with any festive cookie and candies of your choosing. 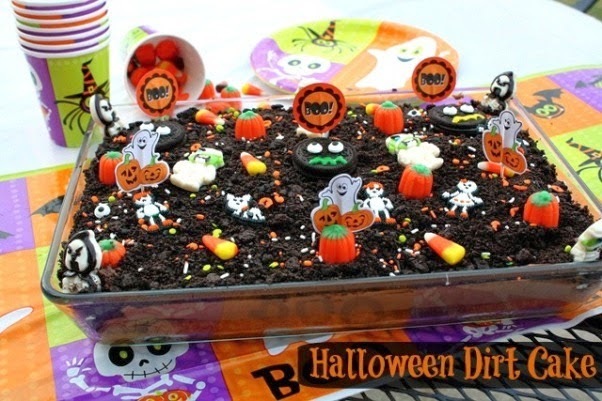 Since the crushed Oreo cookies resemble dirt a Graveyard Cake is always a fun option. I chose to go with just a basic Halloween theme and used a variety of candies and cookies. I found everything from the tableware, cake ingredients, and fun candy decorations at my local Walmart. Preheat oven to 350 degrees. Spray a 13 x 9 inch baking pan with non stick baking spray. In a large bowl or kitchen aid mixer prepare the cake mix, adding butter, eggs and milk. Mix to combine. Pour the cake batter into prepared pan. Bake at 350° for 30-35 minutes until golden brown on top and a toothpick inserted comes out clean. Cool cake on a wire rack for 3-5 minutes. Using the back of a wooden spoon poke holes in the top of the cake (making sure to go all the way through). Prepare pudding mix according to package directions adding the 2 cups milk. Mix until a semi thick consistency (you want the pudding to be a bit runny). Add the whipped topping and mix to combine. Pour the pudding mixture over the cake making sure to aim into the holes. Spread the pudding over the cake until smooth. Crush about 3/4 a bag of Oreo cookies in a food processor (save the remainder to decorate as monster faces or use as tombstones). Add the crushed Oreo cookies over the top of the cake and decorate with desired candies and sprinkles. Refrigerate until ready to serve. Cooks Note: To make a boxed cake mix taste like a bakery cake substitute milk in place of the water, and butter in place of the oil called for on any cake mix. You can also add an extra egg than called for on the box. Halloween is fun, but it's also the time of year for endless candy. To help balance it out a bit try mixing in a few healthy options. 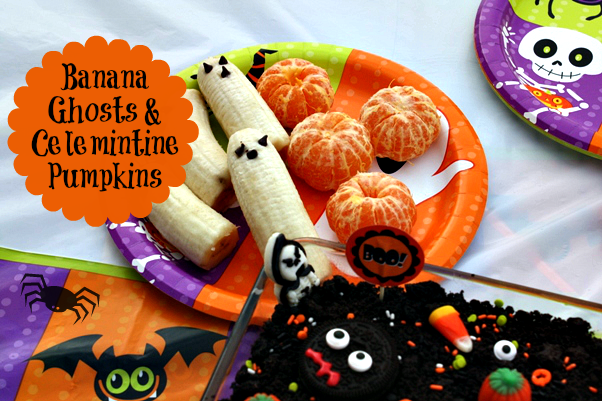 These cute little clementine pumpkins and banana ghosts are perfect. To make the ghosts, cut the bananas in half and use mini chocolate chips for their eyes and mouth. For the pumpkins use clementines tangerines and add a small piece of cut celery to use as a stem (I did not do). 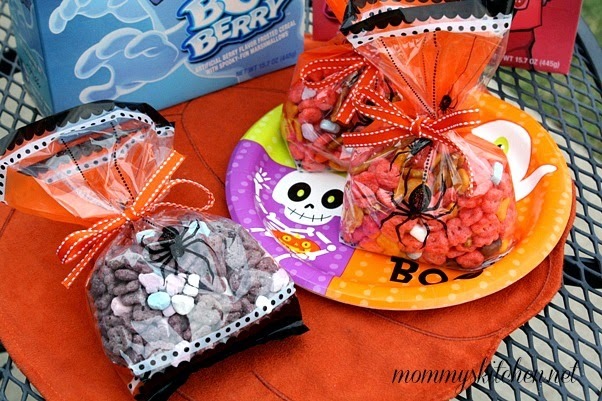 I also packed up some Halloween treat bags and filled them with General Mills Franken Berry and Boo Berry cereal. I love the Halloween cereal varieties, but they only come out during Halloween, so I always grab a few extra boxes. Cereal treat bags are perfect for school and group parties. Stop by Walmarts Food & Celebrations page for all things spooky and fun. Are you Looking for more easy Halloween Ideas? The Walmart Moms have you covered. Check out their blogs and their ideas below. Very festive, cute looking Halloween Cake. I have done these in clay pots before; just big enough pots for individual servings. When you substitute butter for the oil in a boxed cake recipe, do you use melted butter? Or just softened? You can use softened or melted. I always just use softened and it works perfectly. Can u make cupcakes with this recipe? Yes you can make cupcakes as well. Can you use already made pudding with no whipped cream?